Well, my furiend....it is just about time! I've got my lukhky khollar and lipstikhk pikhked out! ... yes, "A dog-door in evfurry door!" Paws crossed for woo, our khanine khandidates! Good luck, Turbo and Khyra - we know woo will win paws down. 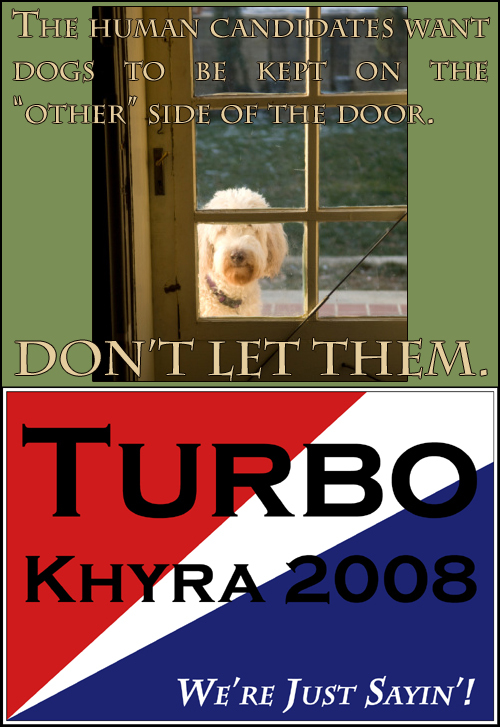 Good luck Turbo and Khyra! I have to say, though, if the dog is big (like in that picture) and likes to herd, can we still keep it on the other side of the door? My paws are crossed for you for tomorrow. I know you will do us proud!